The dryer dries. I got the switch changed with no trouble. However, it required unplugging the dryer. My arms aren't long enough to plug it back in, so Bob, being the tallest person I know, came over and plugged it in for me, bless him. I'll do a load of clothes after work tomorrow. This afternoon I changed the curtains and decorations for fall, and your big wooden candy corn is out again. That thing was such a joke between us, since you love candy corn and I hate it. 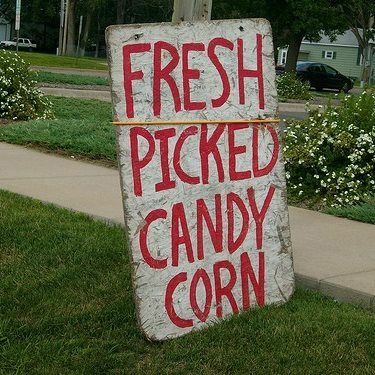 I found it when I was shopping with your sister, and just had to get it for you so that you could have candy corn whenever you wanted. I still get it out every fall and it always makes me smile. I need to get to bed. I was going to stay up - we're having a super-moon eclipse tonight at 10:30 - but we have heavy clouds so there's nothing to see here. I'll catch it on line tomorrow. It will be a busy day at work, getting everything unpacked and set up, ready for the new building to open on Tuesday. I'll enjoy it because it will consist of organizing and arranging things. But it will be long and tiring. We get to wear jeans, so I'll wear my athletic shoes, too, and my feet won't hurt as bad as they usually do. I know, I need bunion surgery. But I can't afford the time off from work, so I'll just wear athletic shoes tomorrow. I can have surgery after I retire. Right now, the dog is outside and Hunter is asleep across my knees. Abby and Maggie just chased each other up and down the hall. It's dark and cool and quiet outside, and time for all diurnal mammal to be asleep. I'll fall asleep thinking of you.